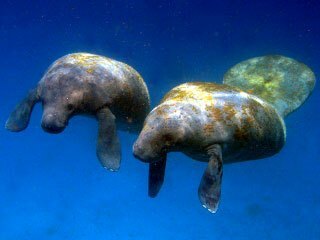 Designated a marine reserve in 2012 and considered by most to have the best resort-based diving in Belize, Turneffe Island is on all of the liveaboard routes and hosts a small number of picturesque dive resorts that allow scuba diving from your doorstep. 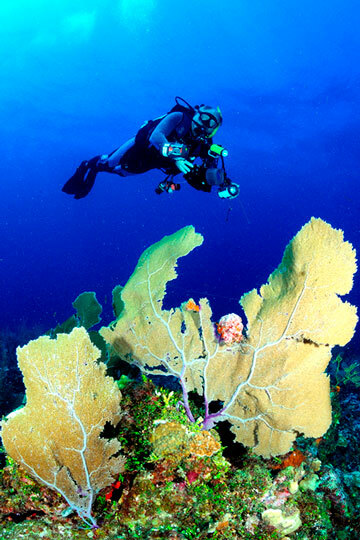 Turneffe has dive sites suitable for every level of diver. Along the western side, the shallow reefs are perfect for the novices and casual divers, while the varied topography on the east and south sides are more suited for the seasoned diver. Wrecks, drop-offs and channels make for a good variety of sites and larger reef fish, turtles and spotted eagle rays are frequently sighted. The endemic whitespotted toadfish is a delight to find for any diver. The Elbow is the "must do" dive on Turneffe, and stunning drop-offs and dramatic reef formations set a spectacular background to this site. Large schools of snappers and jacks feed in mid-water above the reef, large jewfish (goliath grouper) and other groupers hide in the canyons. Groups of eagle rays are commonly seen as well as occasional sightings of sharks. If you're here for any length of time you'll probably want to dive this site more than once. The Wreck of the Sayonara is a former passenger/cargo boat that is now bedecked in impressive sponges and corals. It provides a multi-colored backdrop against which can be seen schools of French grunts, parrotfish and a variety of angelfish. Closer inspection reveals basket stars, coral shrimp and file clams. The nearby reef is home to schools of barracuda and there are several impressive coral patches on the sandy slope. With over 70 known dive sites at Turneffe, there's enough variety and big fish action to keep any diver happy for weeks. 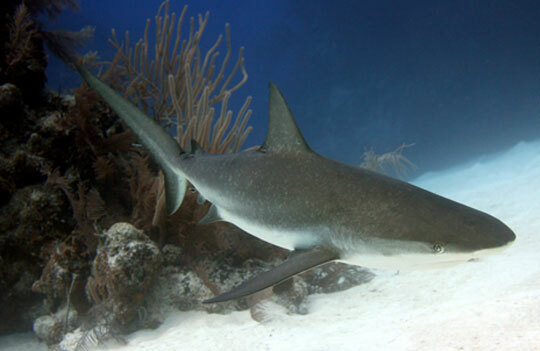 Caribbean reef sharks and the ever-present nurse sharks are occasionally joined by solitary hammerheads and blacktips. 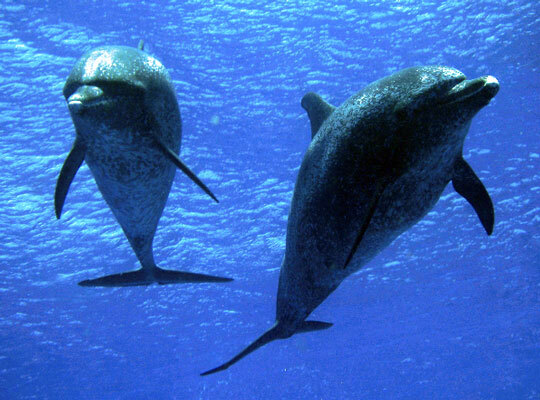 A small pod of bottlenose dolphins live in the south lagoon and spotted dolphins also regularly hunt in these waters. Manatees and American saltwater crocodiles can sometimes be seen in the water away from their lagoon home. One of the best wall dives in the area is Chinaman's Wall. Typically, you'll descend down the wall to 70 to 80ft (20-25m). Here you'll see the wall adorned with vase and yellow tube sponges, sea fans, and crevices with lobsters, arrow crabs and goldentail morays. Eagle rays glide by in the blue, blacktip sharks roam the depths, dog and red snapper, Nassau and black grouper congregate in the recesses and ledges. Large barracuda often appear as if from nowhere in search of stray blue chromis or black durgeons that inhabit the zone close to the wall. The second portion of your dive will involve gradually ascending the wall and swimming over the lip on to the reef flat. 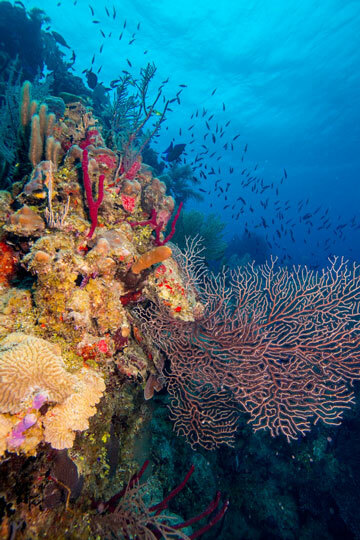 At Calabash Cut you'll find a vibrant coral garden with large sea plumes standing tall off the reef and sea rods waving in the gentle surge. French and gray angelfish, and queen triggerfish wander serenely through the fans, whitespot filefish give way at the approach of divers. 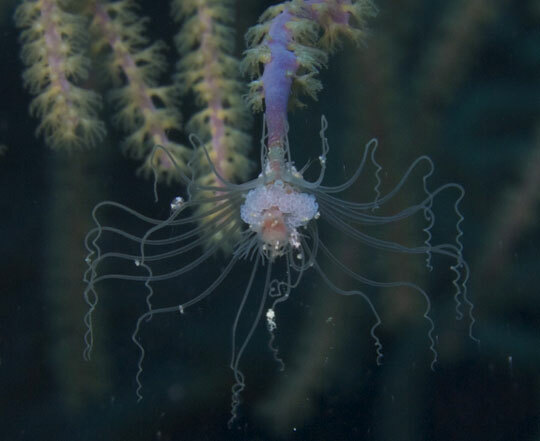 Take your time to check out the holes and ledges at the base of the coral heads; octopus, channel clinging crabs and decorator crabs can often be found here, and small corkscrew anemones host Pederson's shrimp and occasionally squat shrimp. But perhaps the most highly-prized sighting is the curious looking whitespotted toadfish which is endemic to Turneffe Reef. Usually you'll get to see its dark and spotted flat head peering out of a hole, resplendent with a ragged looking beard running below its wide mouth. Large barrel sponges dot the reef and these are often a favorite snack of hawksbill turtles which often bite chunks from them, so look out for these too. Spotted drums can sometimes be seen too; these unusual looking fish are quite wary so ask your dive guide to help find you one. More curious yet are the juvenile trunkfish. 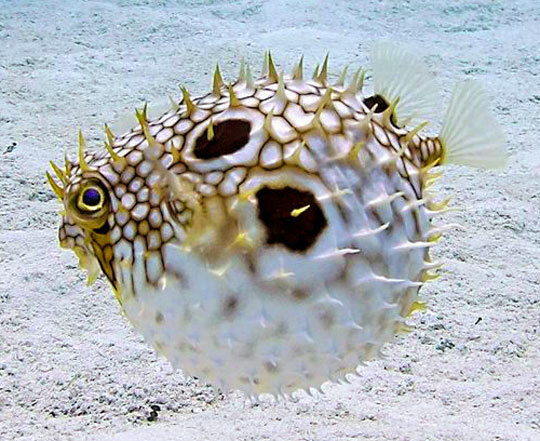 These tiny spotted box shaped fish hide in small crevices and look a little like a gambling dice. 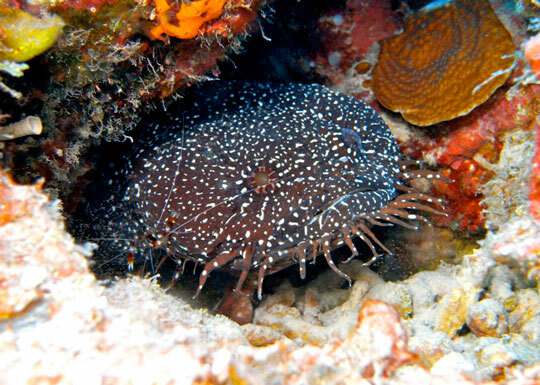 At other sites along the Blackbird Caye coast such as Sting Ray Motel, you'll find the reef flat is simply a sandy slope or has sand chutes leading down to the reef wall. This is a good place to spot southern stingrays, tilefish and garden eels. Fantail blennies make burrows in the sand and poke their tiny heads out as divers swim past. Stop for a moment to allow these blennies to relax in your presence and they will reward you with a little dance! As you end your dive, you'll ascend through the water column up to 16ft (5m). 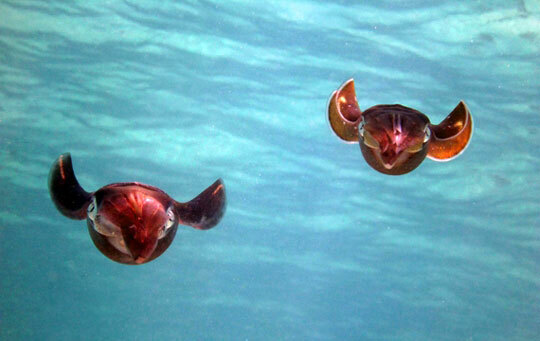 Now is the best time to encounter squid that propel themselves in small groups across the reef. Schooling horse-eye jacks are often seen too, or you might get really lucky and spot a pod of dolphins, or one of the manatees that sometimes make their way out of their nearby lagoon mangrove home. Probably the most famous site on Turneffe, The Elbow is located on the southern most tip of the atoll. It is exposed, deep and wide where the main reef changes direction. The reef flat is at 60ft (18m) and the site progressively deepens toward the southern tip of the elbow shaped outcrop, hence the name. There are several V-shaped deep cuts into the steep slope that descends into the dark depths from here. Excellent visibility and a northerly current can be expected above the reef but this can change so check before planning your dive. The area is a spawning aggregation site for jacks, groupers and snappers, and for this reason it has been designated a 'no-take zone' within the marine reserve. Huge congregations of large fish gather in mid-water above the reef, often in distinct groupings, forming a moving wall in the blue. Depending on season, you can find cubera snapper and dog snapper (easily distinguished by their tear mark below their eye) at the greatest depth, then horse-eye and yellow jacks above these, then gray and mahogany snapper, and finally large schools of permits, bar jacks and rainbow runners in the shallowest sections at about 40ft (12m). Environmental conditions can be quiet harsh here, large ocean swells can make entries and exits challenging so the Elbow is not recommended for novices. Most of your dive will be spent in mid-water checking out the large shoals of fish. The currents usually take scuba divers away from the reef towards the deeper water so make sure you keep a close eye on your computer and air consumption. A challenging but ultimately extremely rewarding dive. The sites in the south east of the atoll such as Turneffe Island Lodge's Front Porch have a shallow reef at 40 to 50ft (12-15m) then a steeper slope running out to greater depth. The reef and slopes are cut by several deep grooves which attract marine life. The area is great for spadefish (batfish), loggerhead and hawksbill turtles, and groupers wait out the day light hours in the ledges on the slope. In the south west the dive sites are characterized by a wide reef plain that runs from 50 to 70ft (15-20m), then a steep sloping wall. The crest attracts amber jacks, barracuda, mutton snapper and permits. 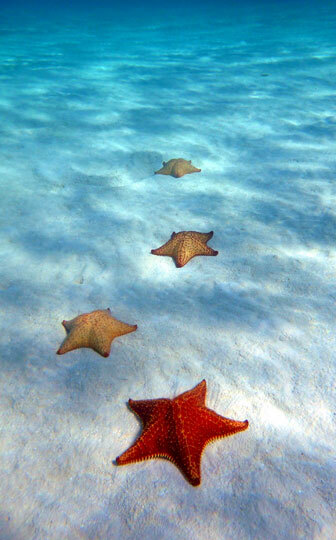 The shallows are fairly sandy but have huge heads of coral which are great to explore. 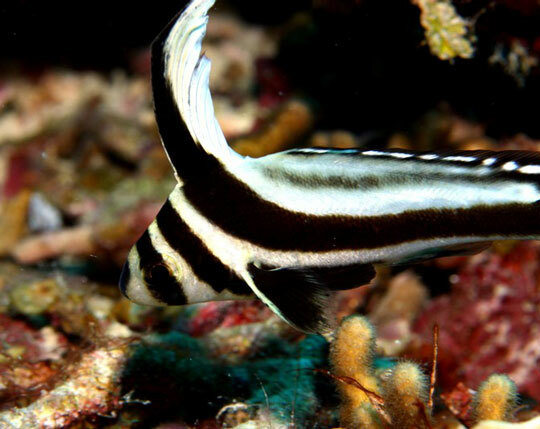 Here you might find yellowbellied hamlets, tobaccofish, as well as the more usual smaller fish such as chromis and damsels. A former passenger boat, the Sayonara was sunk here in 1985 on sand at a depth of 50ft (15m). Formerly the transport boat for the Turneffe Island Lodge, her wooden hull was swept away by the hurricane of 2003. Now all that remains are a few cables, pipes and metal frames, and the skeletal imprint on the sandy sea bed. 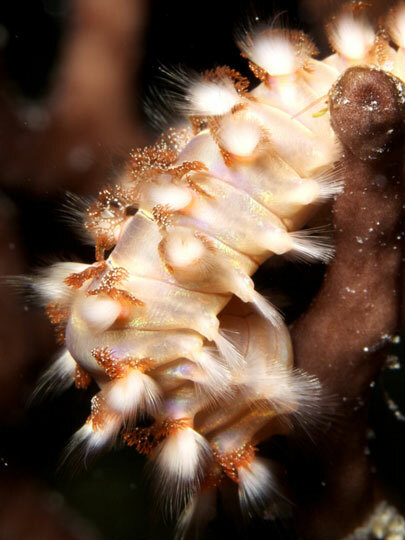 The reef around the Sayonara however, is still interesting and is home to some interesting invertebrates. Basket starfish, with their arms folded around the central body, cling to sponges or hard coral heads. 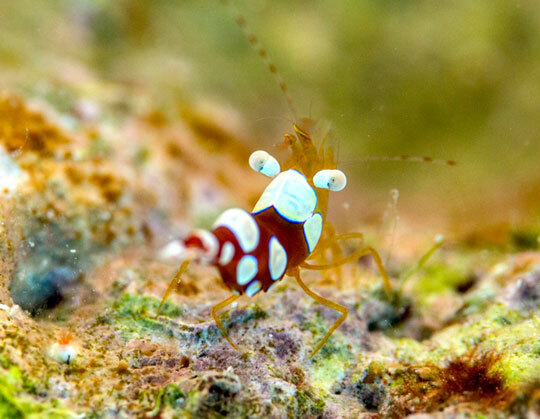 Coral shrimps and file clams have also taken up residence here, affording great opportunities to macro photographers. The reef upon which the Sayonara rested makes a stunning backdrop. Coral bommies 25 to 30ft (7-8m) across and almost as high dot the sandy seabed. But most impressive are the size of the giant barrel sponges, some of them reaching 7ft (2m) in height. Bright red finger sponges, yellow tube and encrusting sponges splash color all over the reef. Stoplight parrotfish, barracuda, French grunts, queen angelfish are among the more common species found here. Look carefully on the sand and you may spot a perfectly camouflaged peacock flounder gazing up at you. At Lindsey's Back Porch a steep, and in some places vertical, wall runs from south to north before veering out to sea in a easterly direction. Black groupers and occasional sharks can be found here but the top of the wall is renowned as the best place in Belize to see its 3 large parrotfish species which all grow to 3+ foot long. Rainbow parrotfish are yellow/green/bronze/purple, the blue parrotfish has a humphead and fang-shaped tail, and the midnight parrotfish is navy blue with a yellow/beige band above its mouth. The reef flat at 60ft (18m) has a large amount of sea ferns and sea plumes and only smaller colonies of hard corals due to the damage they suffer from the infrequent hurricanes. Loggerhead turtles are found in this area. As the wall heads east, the flat deepens to 80ft (24m) and there is a wide sand channel running along the top of the wall. 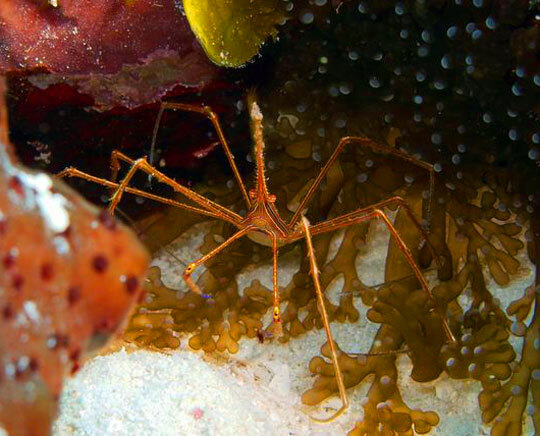 Cockroach Caye has a deep wall off its east coast with a sandy reef flat and just a coral fringed wall lip. 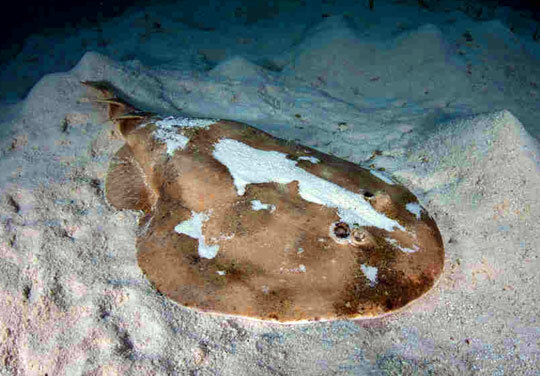 Divers often find southern stingrays and flounders on the sand as they head towards the island and its fringing shallows. The shallow coral area has several cleaning stations and is well populated with juvenile fish of many species. Lettuce Lane is named after the previously prevalent number of lettuce corals in the area. Here is the best place to find the lettuce sea slug - a green/yellow colored nudi with a convoluted body shape. At sites such as Pelican Caye, some 1640ft (500m) north of the island of the same name, you'll drop into 120ft (35m) of water above a sandy sea floor with scattered patches of coral. Here ocean triggerfish gather in their preferred open water habitat. Swimming back in the direction of land, you'll soon reach the sharply sloping reef which rises to 55ft (16m) and then levels out again to form a wide flat plain of sea ferns, fans and large-leaf watercress algae, cut by sand channels, with an almost imperceptible slope up towards the shallows. Nurse sharks roam over the reef and green turtles often rest on the coral substrate. Surgeonfish and porkfish tend to accumulate around the small bommies that protrude from the floor. Spotted toadfish can also be found by keen-eyed divers. At The Flats' Front Porch a broad relatively flat coral plain at about 60ft (18m) ends abruptly to the east with a dramatic deep water terrace that drops well beyond 130ft (40m). The terrace has several ridges that run out into deep water and that form subterranean bays and canyons that run from out in the blue and cut deep up the terrace. This area is a great spot to hover for a few minutes, searching in the blue for blacktip sharks and reef sharks. Once you're back on the reef flat, you can move across the fields of tall plumes, some reaching over 10 feet (3m) high, to the large hard coral bommies that characterize the plain. Grunts, squirrelfish and doctorfish are often found lurking around these outcrops. The doctorfish is a type of surgeonfish and can be distinguished from the blue tang by its paler blue body and a yellow patch at the base of its tail. Scorpionfish can be found resting stationery but fully alert on the rock, and the invasive lionfish seem to occupy every small ledge. The Terrace is a deep dive with a overhanging wall running down to a wide sandy ledge at 100ft (30m), then another wall cascading down to 150ft (45m). The deep water has a sloping sand channel with various rocky ridges which are just beyond recreational limits. The wall is pocked with holes and some cavernous crevices. The deeper sections are dominated by wire corals and black coral bushes which prefer the darker environment. Fairy and blackcap basslets, and sunshinefish occupy these bushes, green morays slide up and down the wall in search of prey. The reef flat here has many gorgonians, sea fans and coral bommies shrouded in brown chromis, and is punctuated with several clear channels that run across to the wall. These are great for divers to explore in search of critters such as neck crabs and many slippery dicks and juvenile parrotfish feed here such as the stoplight and princess parrotfish. Small schools of blue-striped grunts also congregate here in shelter of the gullies. Chasbo's Corner is one dive site where you might get lucky with more schooling action. The abutting elbow-shaped wall sometimes causes current eddies that attract bigger fish. Aggregations of blue tang and groupers sometimes form off the wall. Elkin's Bay has an interesting swim-through feature for scuba divers to navigate. The entrance to the short tunnel is about 6ft (2m) wide and can be found by following a sand chute in to the wall at about 60ft (18m). Swim up the sand chute to find the entrance marked by a 5 foot high coral bommie at 40ft (12m). You will exit the swim-through on the reef flat where you can continue your dive. At dive sites such as Black Pearl, the steeper slopes are dominated by barrel sponges, brown branching tube sponges, sea whips, rods and fans. 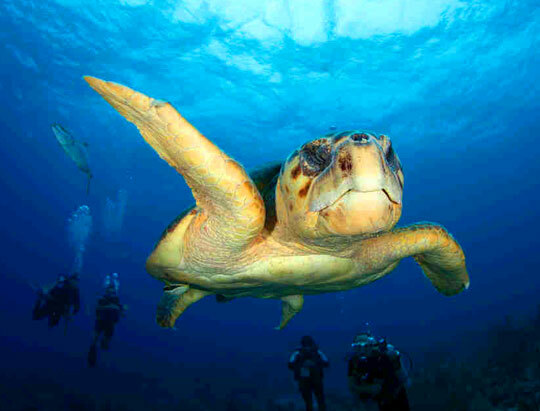 Hawksbill turtles, mutton snapper and large hogfish are common here as well as schools of Creole wrasse and sardines. Examine the mat anemones at the base of the coral blocks and sponges for whitespotted shrimp and tiny anemone shrimp. Pipefish can also be found around the base of coral outgrowths or on the sand. The shallow gardens has denser coral growth and tends to be more colorful with lilac sea ferns, yellow tube sponges, black gorgonian fans and hard corals more prominent. Here you might see small schools of schoolmasters, coneys, spotted moray eels gaping out from under a ledge, southern sting rays buried in the sand. 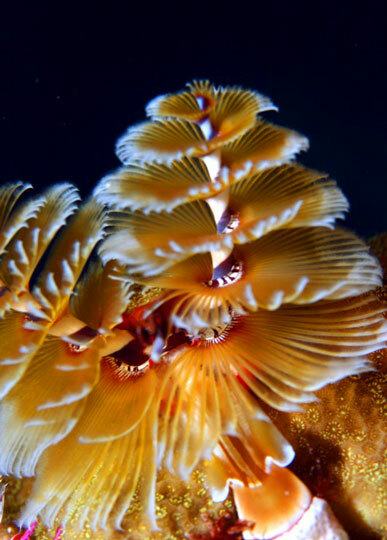 At Amber Head there is one spectacular coral bommie at 100ft (30m) which is 15ft (4m) high and 30ft (9m) across. This is a great spot to see schools of bar jacks and mahogany snappers. Sponge shop has some human sized barrel sponges, and at Crickozeen Cut sand chutes run down the slope and 2 small elbow shaped walls jut out from the slope. This is a good place to see some of the large black groupers and several eagle rays are often found hunting close by on the slopes. To the north of Crickozeen Creek are another half dozen or so dive sites. These also exhibit sloping reefs but here the coral formations are more sparse and the marine life is therefore more concentrated on these coral hotspots. 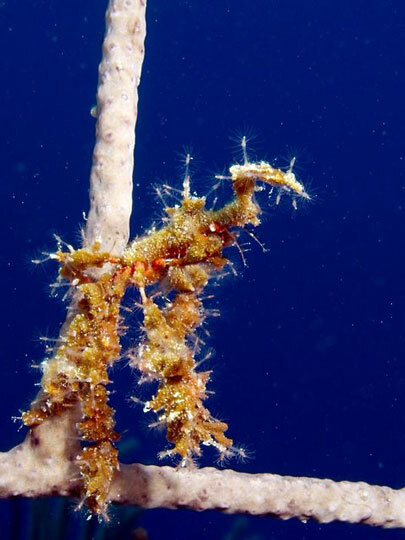 For more information on your diving options, and all the other travel information you might need to visit here, read our Turneffe Atoll dive resort or Belize liveaboard section. Away from the tourist crowds of Ambergris Caye, the small and serene Turneffe dive resorts allow you to relax and unwind among a stunning natural setting with great diving just a short boat ride away. Alternatively, all of our high quality Belize liveaboards visit the atoll. The east and west sides of Turneffe's islands, from north to south, each offer something different so there is plenty of variety to satisfy most visiting divers at the atoll. The east coast sites are dived when conditions allow, and the west coast sites are visited when the swells on the east and south coast pick up. From November through February, the northerly winds can blow in to Turneffe, bringing with them cooler weather. The stronger gusty periods can force divers to switch to the leeward south side and east coast of the atolls. Surge can also be present if the winds are particularly strong, but dives are very rarely cancelled as there are so many sites to choose from. Water temperatures drop to 78-80°F (26-27°C) during these months and visibility is around 80ft (25m). From March through October the easterly trade winds blow, making the leeward west coasts of the atoll the favored diving locations when the winds are strong. Temperatures now average 84°F (29°C). During the dry season from March through May the visibility can reach 100+ft (30+m). From June through November (rainy season) the rains can at times force murky water out of the lagoons and visibility drops to 50ft (15m). The Elbow is a favored spot for fish to spawn. Mar/April/May is the time for mutton snappers, January for black groupers and tiger groupers. Lots of these fish congregate off the wall during these times. In May/June/July horse eye jacks also use the Elbow, as well as Jo-Jo's and Chrissea, for spawning. 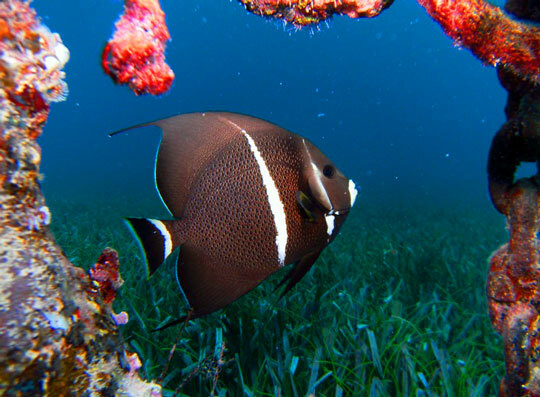 Jo-Jo's and Calabash Island are favored love spots for some reef fish species. 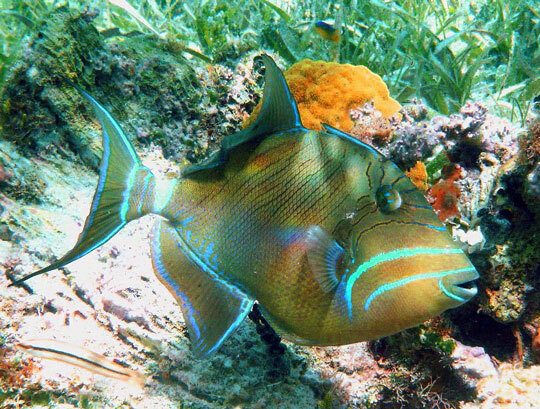 In July, hundreds of ocean triggerfish take over the entire reef and they protect their nests from other reef fish. February/March sees the turn of blue tangs to spawn. 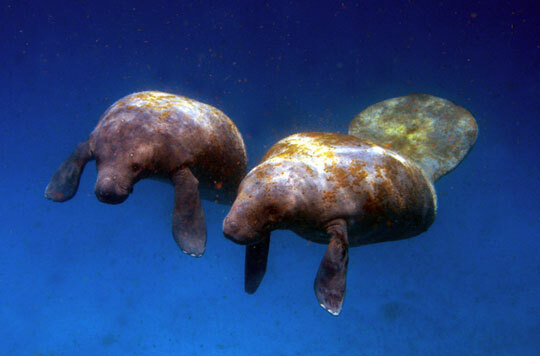 You can see masses of them at the Calabash dive sites in the afternoons. Over at Mid Point on the west coast, dog snapper spawn in May/June/July. July/August is loggerhead turtle nesting time at Turneffe Island so will see more of them in the water during this time. Pilot whales and killer whales migrate through the area from March through June. Where is Turneffe Atoll and How Do I Get There? Review our map below of Belize, showing the location of Turneffe. Here, you will find information on how to get to Turneffe Island.